I had a great time in Nottingham for my friend's stag do. 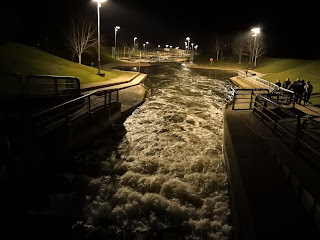 On the Friday evening we went white water rafting at the National Water Sports Centre which we were all apprehensive about. This was not helped by the staff telling us not to swallow the water as the bacteria could make us quite ill(!) But once we got going it was really good fun, we all got wet (although I managed not to fall out) and got some experience of the rapids. It really makes you appreciate just how good the Olympic canoeists are! Rowing for an hour and a half really takes it out of you. After that we went out for a meal and then had an evening wandering around Nottingham - not entirely planned it must be said, for the club we had planned to go to wouldn't let us in due to some people not having ID. We eventually ended up in a pretty good place called The Bodega, where there was the random sight of a woman wearing a Mapei cycling cap (she managed to pull it off, it must be said). I barely slept Friday night but it seems most people were also struggling from tiredness. A lot of people were also aching from the rafting but I wasn't suffering for once! Saturday's first activity was indoor crazy golf, and of course as my brother was present things became very competitive! I think I beat him by 10 strokes in the end, and came 3rd overall. We then headed to The Dragon pub as we had their Racing Room hired for the afternoon. Who knew that Scalextric could be so exciting and complicated?! Fuel tanks, KERS, lane switching! Each of us took part in 12 races each and at the end the total points determined who was the winner. Again, Jonathan and myself were very competitive! The organiser read out the final table in reverse order, and he got up to 5th without mentioning me or Jonathan. The relief and joy when he announced Jonathan in 4th place became even better when it was announced that I had come 3rd with the same number of points as 4th, but was higher based on "most aggregate 2nd places"! Fittingly the stag won overall. After dinner we had another night out in town, this time heading for the Retro Rooms. Not all of us made it there but those that did had fun. Somehow I was still awake and drinking when the clocks went forward! It turns out if I stick to whisky+coke I can keep going longer than if I drink beer and without feeling sick. We were all a bit worse for wear on Sunday but it was worth it, we all had a fantastic weekend and the stag had a good send off before the wedding in June. 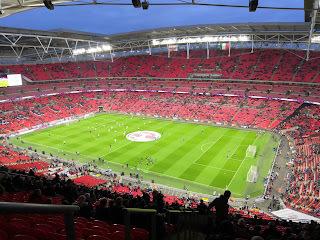 Last Tuesday I took Nicky to Wembley to see England vs Italy. It was my first visit to Wembley in about ten years and Nicky's first. I had been panicking about finding somewhere to park but in the end I made life easy for myself by booking a driveway using JustPark somewhere near Stanmore and getting the Tube in - only 3 stops and 8 minutes from Canons Park. We were up pretty high (that's what you get when two tickets cost £30) but could see pretty well. Both goals were at our end, Nicky was happy about Vardy scoring but no-one was happy about the penalty VAR farce. 1-1 was probably a fair result, England need to improve massively if we're to have any chance in Russia. 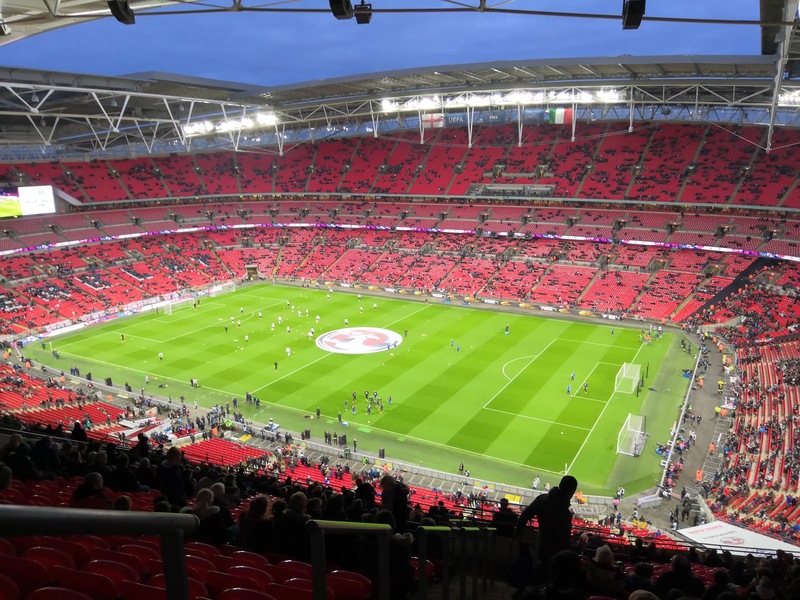 Wembley Stadium is in completely the wrong place, meaning it's impossible to get out afterwards. People obviously know this because by the 85th minute the stadium was half empty which is pretty sad really. We left at full time and had to wait 30 minutes to get into the Tube station, but we were travelling in the opposite direction to everyone else so it was pretty quick once we were in. Nicky was 9 on Monday, I'm not sure where the 9 years have gone but it's been both very quick and very slow at times! We went to see Southend vs Gillingham, 4-0 and a man up at half time! It finished that way but it was a good match to go and see. Nicky then had a party yesterday at a games venue featuring networked Xbox 360s, he had fun even though there were a few no-shows.